Garment Structuring Architecture is a project that aspire to evoke creative thinking of architecture using fashion design as media. It was realized in the form of a workshop. Participating students were encouraged to analyze different architectural aspects (such as form, construction, program structure, spatial motion) using designed garments from renowned designers ( Comme des Garçons, Viktor & Rolf, Sandra Backlund, Alexander McQueen, Hussein Chalayan, Yohji Yamamoto). The use of different techniques in a working process (diagrams, collages, models etc.) helped students to collect valuable information for the next part of the workshop. The aim of the second step of the project was to create architectural concept / principle based on the conclusions derived from analysis. 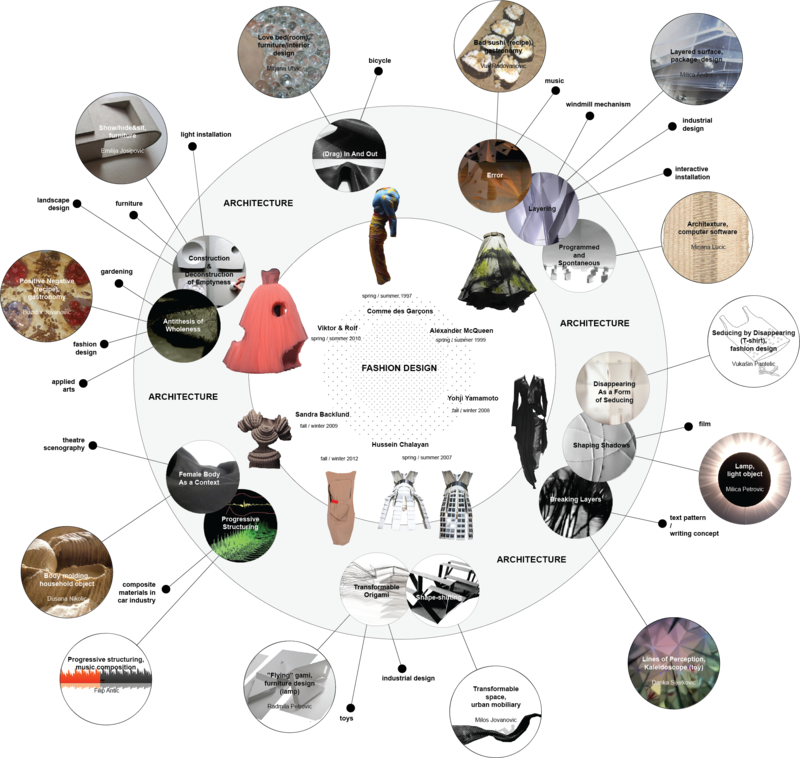 Implementation of these principles in another visual discipline had resulted with designed “products” that vary from software concept to furniture design. Božidar Jovanović, Danka Sijerković, Dušana Nikolić, Emilija Josipović, Filip Antić, Milica Andrić, Milica Petrović, Miloš Jovanović, Mirjana Lučić, Mirjana Utvić, Radmila Petrović, Vuk Radovanović and Vukašin Pantelić.